When a film becomes successful, everyone involved in the making of the movie wants to take credit for its success. The truth is that every successful film owes its fortunes to just one person — the screenwriter. Without the screenplay, there is nothing. Think about it. You can have the best actor, the best director, the best cinematographer, but if you don’t have a story to tell, what are all those highly paid individuals going to do? So it all starts with the script. In the case of High Noon, that credit goes to screenwriter Carl Foreman. Now having a great screenplay does not guarantee a great movie. For that, you need all of the other pieces to fall into place. The book High Noon by Glenn Frankell deftly describes how one picture defied the odds and became a classic of the genre. Juxtaposed along with the behind-the-scenes stories of High Noon are the stories of lead actor Gary Cooper and the Hollywood blacklist. 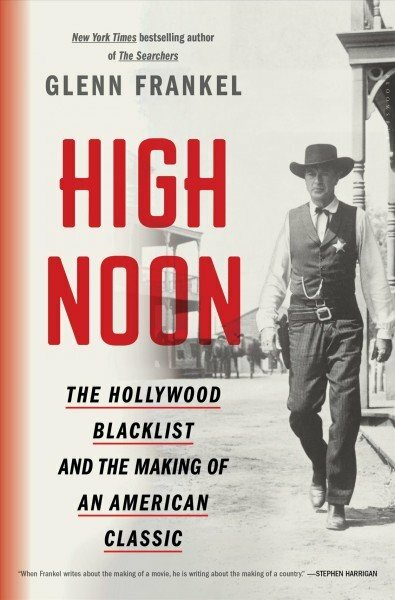 The author intertwines the three stories from the initial concept for High Noon to the Oscars. High Noon came about during the peak of the House Committee on Un-American Activities hearings in Hollywood. The stated goal of the Hearings was to root out individuals wishing to overthrow the government. The whole thing was a case of government overreach, misunderstanding, and baseless charges that left hundreds of talented people unable to earn a living. Carl Foreman, a former member of the Communist Party, was called to testify. He refused to name names of other party members. He was eventually blacklisted. The story told in High Noon, where a lone sheriff if forced to face off against four gunmen out for revenge, is an allegory of the fear of that period. As for Gary Cooper, he was an aging actor whose prospects were dwindling. He was before my time, but he did star in one of my favorite movies — Seargent Yorke. His portrayal of Sheriff Kane as someone willing to stand up for what is right despite the odds was part of the film’s success. I watched the movie after reading the book. I thought it held up well despite its age.